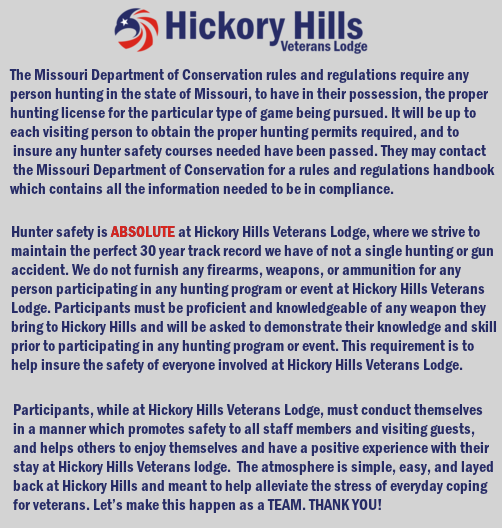 Hickory Hills Veterans lodge is located in Green City, Missouri, in beautiful Sullivan County. It consists of rolling hills of timber with meadows interspersed and a creek which runs the length of the property. The property is located within the North Branch of Spring Creek Natural area, which stretches for two counties in Missouri. This is an area the Missouri Department of Conservation has designated as a focus area for them to implement conservation programs, as well as biology efforts into. There is an area within ¼ mile of Hickory Hills where only a specific rare native plant grows in all of Missouri, and has been part of their effort in saving. Together as a Partner with Hickory Hills Veterans Lodge the Missouri Department of Conservation has allocated a replanting program for the grounds of Hickory Hills for future conservation. Veterans can learn of this program and be an integral part of helping conserve future Missouri ground for all to enjoy. By helping with programs at Hickory Hills veterans can use their experience and training to help themselves and benefit others in the process. Hickory Hills has some of the most beautiful scenery you will find in the country. Veterans can enjoy fishing at several area lakes, or ATV rides. In the springtime there are managed turkey hunts with some of the greenest explosion of color and beauty found anywhere. There is little to match the exhilaration of an adult Tom turkey sounding his morning gobble during the crisp spring morning. Trying to match wits with these birds can be quite the experience. In the afternoons there is spring wild edible mushroom hunting, usually followed up with fishing, and later maybe a cook-out. 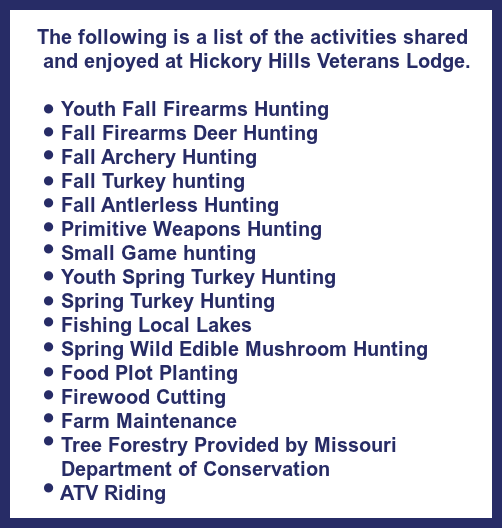 These types of outdoor activities are shared and enjoyed with other seasoned veterans and are an integral part of the team building and support structure, offered to the veteran receiving the benefits of Hickory Hills Veterans Lodge. Our veterans, and brave men and women in uniform need and deserve this help and support structure in their lives. Please help us, to help them, with a generous donation to Hickory Hills Veterans lodge. Thank You for your support!